In 2013, I co-founded the Biodiversity Initiative with Dr. Luke L. Powell and Dr. Jared D. Wolfe. Since then, the Biodiversity Initiative has been focusing on on quantifying the bird and mammal communities of Equatorial Guinea. Beginning in 2014, I began working on graduate research in parallel to the Biodiversity Initiative work, focusing on the ecology and phylogeography of Central African birds. Please see the publications page to view some of our results from this work. Photo: Bioko Speirops Zosterops brunneus on Pico Basilé, Bioko Norte, Equatorial Guinea. For my Master's, I worked on niche modeling with Hummingbirds at the University of Kansas (submitted; in review). With regards to niche theory, my primary research involves modeling methodology, and testing ways of defining training areas for predicting species richness and community composition within the hummingbirds (Trochilidae). Using ecological niche models, we are able to make estimations of the number of species that occur in a given area, and even make predictions as to which species these will be. I am also working with Diego Barragan regarding niche divergence in the Sclerurus mexicanus complex. Found to consist of multiple species by d'Horta et al. (2013), our study is trying to determine whether these species groups differ from each other in environmental space. 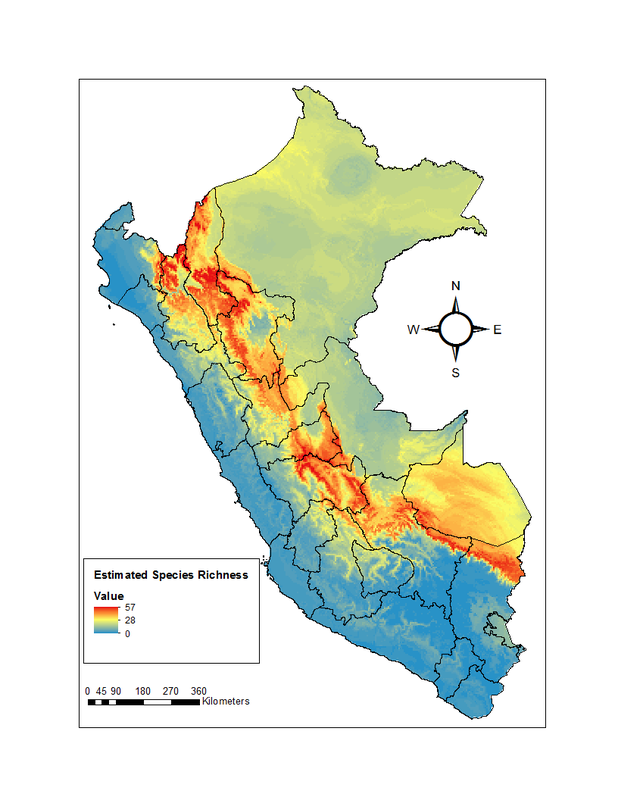 The photo to the left is a map of hummingbird species richness in Peru derived from environmental niche models.